The book - This Train Is Bound For Glory - talks about thirteen churches-on-rails that followed the railroads west from 1890 to the 1940s and brought the gospel and the sacraments to the people living along the tracks. This is a story of America's history, a story of the railroads, a story of amazing grace and faith. This book and other are described on the: Books about Chappel Cars Page. There were three Episcopal cars: The Cathedral Car of North Dakota, and the two chapel cars of Upper Michigan; seven American Baptist Publication Society cars: Evangel, Emmanuel, Glad Tidings, Good Will, Messenger of Peace, Herald of Hope, and Grace; and three Catholic Extension Society cars: St. Anthony, St. Peter, and St. Paul. The stained-glass miniature rose window in the cupola-style transept of the Cathedral Car may have been copied from a similar design on the exterior of the Russian Orthodox cars. 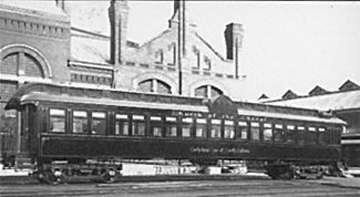 Here the Cathedral Car is parked at the Chicago Pullman shops in November 1890, ready for delivery to Bishop Walker. The first Baptist chapel car, at its dedication at Grand Central Depot in Cincinnati. Paid for with donations from a syndicate of wealthy Baptist businessmen, the car was built by the Barney & Smith Car Company of Dayton, Ohio. Innovative ways were needed to bring the gospel to those who lived off the beaten track. The first Upper Peninsula Episcopal chapel car was probably a loaned railroad car, most likely from the Chicago & North Western Railroad, which was outfitted as a chapel. It was a miracle that chapel car Emmanuel, dedicated in Denver May 24, 1893, was completed. Times had changed since 1891. Because of the financial panic of 1893, Barney & Smith Car Works, like most of the nation's businesses, found itself in deep trouble. In 1893 immigrants by the thousands were pouring into Ellis Island, those who were privileged to stay headed west, wherever the rails would take them. The chapel cars were in much demand by state conventions. Emmanuel is listed on the National Register of Historic Places and has had major restoration at Prairie Village, SD. The Third Baptist car built by the Barney & Smith Car Company was a gift of William Hills, a member of the chapel car syndicate from the Mt. Morris Baptist Church of New York City and the head of the Hills Brothers Company. Glad Tidingstraveled many miles on the Chicago, Burlington, and Quincy route. From 1880 to 1905, the CB&Q colonization plan brought hundreds of people from England, Scotland, Sweden, and Germany to Illinois, Iowa, and Nebraska. Glad Tidings ended its long service in Flagstaff, Arizona. This sketch of the second Chapel car of the Episcopal Diocese of Northern Michigan was used in a promotional brochure. The car perhaps was purchased from the North Western Railroad, where it may have been used as a business car, chair car, or caboose. When Good Will first visited Texas, the state was a wild and diverse land of opportunities and extremes. In the land west of the Pecos River, Judge Roy Bean was the law of the land. With the completion of the Southern Pacific railroad line to Marshfield in 1916, it was possible to bring Good Will to Marshfield, Coquille, Myrtle Point, Powers, and many other Oregon towns. Because Baptist women across the country raised the funds for its construction, Messenger of Peace would be called the Ladies' Car. Viewed by thousands at the 1904 World's Fair, it traveled across the United States and Canada under the auspices of the Railroad YMCA, and delivered the gospel from the Ozark Hills to the Olympic Mountains. Summer's heat, which sent temperatures soaring inside the chapel car, would cause the missionaries to put up the awnings. A remarkable incident occurred during the Herald of Hope chapel car's dedication in Detroit, Michigan, on May 27, 1900. While Dr. Wayland Hoyt was offering the prayer of dedication, a dove was seen flying toward the car. As it reached a point directly over where Hoyt stood on the platform, the dove made several circles in its flight. The few who saw it said it was a thrilling sight. Called the Young Men's Car, this sixth and last wooden car was a project of the young men of the Woodward Avenue Church in Detroit. To provide the finishing touches, the women of the Detroit Woodward Avenue Church furnished the car with linens, bedding, dishes, and other household items, and the men of the First Baptist Church of Galveston, Texas, purchased a handsome brass lectern. The dedication of the first Catholic Church Extension Society chapel car, St. Anthony, occurred on June 16, 1907. It was a wooden 1886 Wagner car, reconditioned by Pullman Company vice president Richmond Dean. St. Anthony's work in Oregon resulted in forty-three missions in the Archdiocese of Portland and forty-one in the Diocese of Baker. It had seen the completion of eleven churches in the archdiocese and nine in the Baker diocese, with several others under construction. At the time St. Peter was built, it was considered to be one of the longest railroad cars in the world. The chapel of St. Peter was finished in St. Jago mahogany with a Gothic design. Although the car was steel, the wood interior trim still reflected the craftsmanship of the Barney & Smith builders. The last Catholic Church Extension Society chapel car St. Paul was dedicated in New Orleans on March 14, 1915. It was donated by Peter Kuntz of Dayton, Ohio. This last 86-foot steel ark would travel the rails of Louisiana from 1915 to 1918, under the direction of Archbishop Nlenk, devoting its work to the mixture of people located there, as well as serving in Texas, North Carolina, and Oklahoma. The designers at Barney & Smith Car Company were asked by the American Baptist Publication Society officials to make Grace, the last of the fleet of American chapel cars, more "churchy." This was done by using Gothic arches instead of the inset block feature that had been a part of the design of earlier Baptist cars. One of Grace's first stops was at the 1915 Panama-Pacific International Exposition in San Francisco. Grace is on display at the American Baptist Assembly at Green Lake, WI.